Thinking this is my last entry for '09, and I couldn't think of a more fitting image to end with. One of my first attempts at digital painting, proved more frustrating than enjoyable. I eventually shelved the image, but I've always liked this idea and as the year approaches it's end, I figured 'let's finish this image'. Pulled it up in Photoshop, dusted it off and voila, it's done. 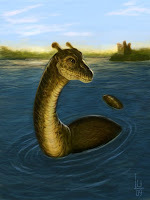 It's based on eyewitness testimonies, rather than the 'Plesiosaur' theory, hence the knobbed horns and horse face. On a side note, I love Cryptoids, even if I don't necessarily believe in them. They're the quintessential 'What Ifs' in this world and despite what my inner skeptic believes, I keep hoping they are real. Hey, ya never know. What a year it's been. When January 2009 first loomed on the horizon, I decided I wanted a fresh start with my art. New portfolio, all digital. Easy enough, since I've revamped my portfolio a number of times over the years. 2-3 months, and I'd be golden. Riiight. Well, it turned out that creating digital art is in many ways completely different from traditional mediums, and I quickly learned I would literally be starting over from scratch. Not only with a new portfolio, but with a new paint medium, of which I knew barely anything about. I also realized this wasn't going to happen in a couple of months. I gave myself a tight deadline. By year's end I needed to learn enough about digital painting to produce decent art, and a finished portfolio. Throughout the whole process, I joined a few forums, where I encountered alot of great and generous people who shared much of their experience and insight as to not only technique, but the industry of illustration as a whole. The folks over at Conceptart.org are amazing, and artists like Daarken, Dave Rapoza, Bobby Chiu, Todd Lockwood...all very generous with their time. Jon Schindehette over at Art Order...who I think should be nominated for saint hood. Great people, and I owe them all big time...even if they don't know it. Anyways...I ramble. The website's up...all new, all digital. Link's over to the right. It's been a journey...but what a journey it's been. 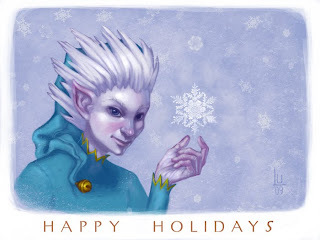 I love Jack Frost, and for 4 years running now, my holiday card always features this harbinger of winter in some form or another. The lore is as varied as it is fascinating, and he's always held a special place in my heart, ever since I saw the Rankin Bass version of his tale. I was sorely tempted to do a zombified version of Jack Frost this year...literally nipping at someone's nose, but since this is going out to family as well as friends who don't quite share my enthusiasm for monsters and such, I figured I'd play nice. For now. Happy Holidays everyone! I realized a few weeks ago that my portfolio to be had not a single dragon image; I mean, a fantasy portfolio without a dragon? Blasphemy! Well I had to correct this situation pronto. I decided to stick to the Dungeon & Dragons setting, since they have a fairly structured catalog of dragon types, most all of them pretty cool looking as well. I didn't want to go with the usual suspects in the DnD line-up however. Y'know...Red, White, Bronze et al. With the release of the 4th Edition of DnD, the Green Dragon had undergone a huge cosmetic makeover, and so I figured it would be a good choice. Toss in some Orcs and we've got a party. 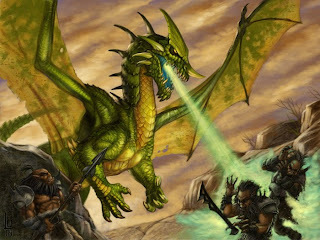 The hardest part was the breath weapon, as it's not your typical cone of fire, but a spray of highly corrosive gas. After finishing it, I realize I now want to do another dragon...or twenty.